IOTA’s Boulevard planters were selected for the recently remodeled Royal Opera House, at the heart of Covent Garden in London. The planters green the remarkable glazed terrace of Restaurant Level 5, with its unrivalled views over Covent Garden piazza. The planting scheme was created and installed by the multi-award winning Design Studio and Landscaping team at Rosebank Landscape. 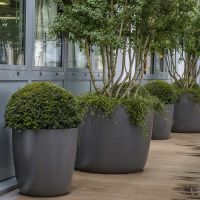 A total of 33 planters were used in this scheme, selected from the KYOTO and QUADRA stock designs in the standard RAL 7016 [Anthracite grey] colour. Boulevard planters are a range of high-performance composite planters made from a proprietary form of Fibre Reinforced Cement [FRC]. All Boulevard planters possess an exceptional strength-to-weight ratio, making them suitable for a wide range of environments – from weight-restricted areas, to interiors, to public spaces and streetscapes.